First Friends is located at 761 Boston Post Road in Sudbury, in a wing of the Orchard Hill Assisted Living Center. The Orchard Hill Center, which opened in 1999, is a brand new, modern facility. First Friends is housed in a separate wing of the facility, with its own entrance, kitchen, restrooms, offices, classrooms and common areas. First Friends also has two separate playgrounds on the premises -- one for the preschoolers and one for the two toddler groups. First Friends used to be located in an unused wing of Lincoln-Sudbury High School. A couple of years ago, however, the high school told us they needed the space and could not renew our lease. We began negotiations with the Orchard Hill people to incorporate a child care center and playschool into their facility. 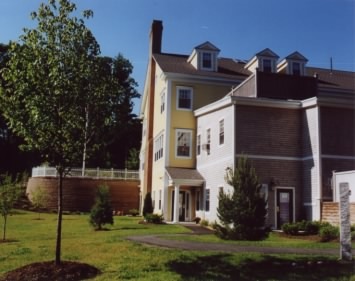 They were enthusiastic about the prospect of combining an assisted living center with a child care center, and worked closely with us to develop the space in a way which accommodated First Friends' needs. First Friends has an extended lease with Orchard Hill, and plans to be around for a long time. ©2000 Sudbury Parents for Child Care Services, Inc. All rights reserved.